Night or day, Machie Greene and his team at Cambopello Whale Rescue in the Bay of Fundy are ready to save whales. Every call is important, but when a call comes in for a North Atlantic Right Whale, the stakes are higher. There are estimated to be no more than 500 of their kind left in the wild. Of these, 85 percent are scarred from encounters with fishing gear. Every year over 300,000 whales, dolphins and porpoises become entangled in fishing gear and die. According to the WDC, this is the most serious issue facing whales today. Nets and fishing gear kill more whales than any other single threat. Some people, like Machie Greene, are fighting back. 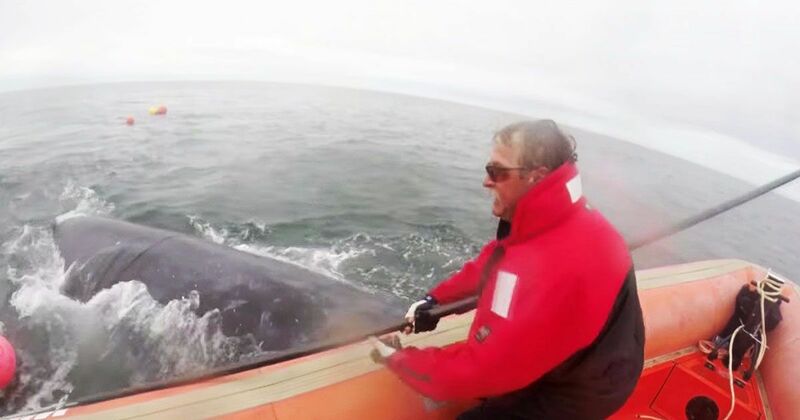 His team uses special tools to cut netting and gear from the creature’s body, but the whales are not always cooperative. Rescue teams usually attach a buoy to the whale. This slows the animal and makes it easier to track - allowing the rescuers to assist even as the whale resists. The entire process is physically and mentally taxing. Even with cooperation, rescuing whales is a dangerous and time-consuming business. Small boats are vulnerable when set so close to these giants, and the whales are often in distress. The video below shows the rescue of a 6-year-old North Atlantic Right Whale. He seemed to understand that the team was there to help. He kept returning to the side of the boat, allowing the men to continue their work. After five hours of concerted effort and struggle, he was finally freed. Regular people like you and me are the first point of contact for distressed whales. Once we report the problem to the coast guard, a team of volunteers can be dispatched and entangled whales can be saved.